The recent poll showed Clinton with a commanding lead. According to a new Bloomberg poll released this week, Hillary Clinton is trouncing Donald Trump among voters in the Philadelphia suburbs. In fact, her dominion there is so strong that it might be enough to swing the whole state in her favor come Election Day – and, in winning Pennsylvania’s 20 electoral votes, cut off Trump’s chance of making it to the White House. Philadelphia is being considered a critical state in the 2016 election, despite the fact that it has voted solidly Democratic since 1988. 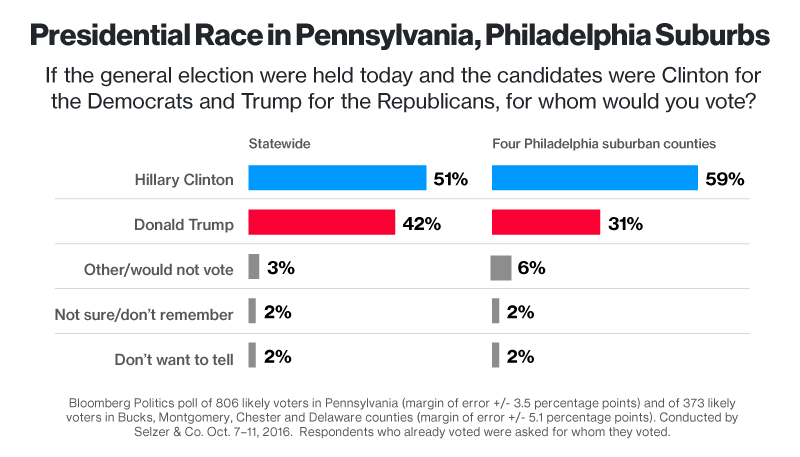 Bloomberg’s poll shows that Clinton holds a commanding 9-point lead over Trump throughout the state of Pennsylvania, and a 28 percent lead in four Philly suburbs once considered to be reliably Republican. In the poll, over 80 percent of those surveyed say that they were bothered by the video obtained recently of Trump using sexist slurs against women and bragging about his sexual prowess. Clinton has long been assumed to carry the urban cores of Philadelphia and Pittsburgh, but her perceived hurdle was the four counties that are suburbs of Philadelphia – Bucks, Chester, Delaware, and Montgomery – which typically account for 22 percent of the Pennsylvania vote and which typically swing Republican. With those counties under her belt, Clinton could forge herself a lead that Trump would have difficulty beating even if he carried every other “swing” state. It wasn’t just the presidential race that Bloomberg covered. They also polled Pennsylvanians and suburban Philadelphians on the Senate race between Democrat Katie McGinty and Republican incumbent Pat Toomey. The two are nearly tied, with McGinty at 47 percent to Toomey’s 45 percent, and McGinty, like Clinton, is doing better in the suburbs than statewide. This particular election could be the one that sways control of the Senate, so it’s a big deal.